The building works near Victoria station has been going on for years, but now some parts of the development are finally ready. The rest is still a building site but the whole Nova area is brand new and quite exciting. There’s a Shake Shack (yum! ), Franco Manca (yes, please!) and lots more restaurants to explore. The Scandinavian one was the first one I tried out, with my dear friends Gaby and Rowena for lunch one weekend. Aster, as the restaurant is called, has a very nice interior (like all D&D London restaurants) and has a café area, restaurant area, bar and deli. We had lunch in the café area but it still felt restauranty enough for a lunch. With lots of familiar items on the menu it was difficult to choose but we got there in the end. Gaby had the meatballs with potato mash, cream sauce and lingonberries. Really nice and I got a small case of food envy (even though my homemade meatballs are really nice too!). I went for the smørrebrød (open-faced Danish sandwiches). One with pork belly, apple sauce and lovely crackling on rye. And one with prawns and mayonnaise. The pork sandwich was lovely and ticked all the boxes but I was disappointed with the prawn sandwich. It tasted nice, but I would have expected at least the double amount of prawns. Smørrebrød always have more toppings than bread but here that wasn’t the case. Rowena had the Aster Caeser salad with prawns, smoked vendace and rye croutons, but it arrived without the fish on the plate (!) and we had to ask for it. Then it took quite a while until the complete salad arrived and it was also smaller in size than the first one. The food was nice though (not wow – but nice) so we had pudding as well. Rowena had the apple cake with custard above which was really nice. And Gaby and I had a cinnamon bun each which was amazing. Still warm, buttery and lovely. We also spied people around us having afternoon tea which looked great so definitely want to go back and try that. There are definitely a few tweaks to be done here, both when it comes to food and service (it was rather slow and wobbly) but hopefully it was all teething problems and it’s fixed now. Pork belly is not at all as popular in Sweden as it is here, but it is getting more and more common, which is great. It seems like pork in general is coming back after being seen as ‘fatty’ for quite a long time. 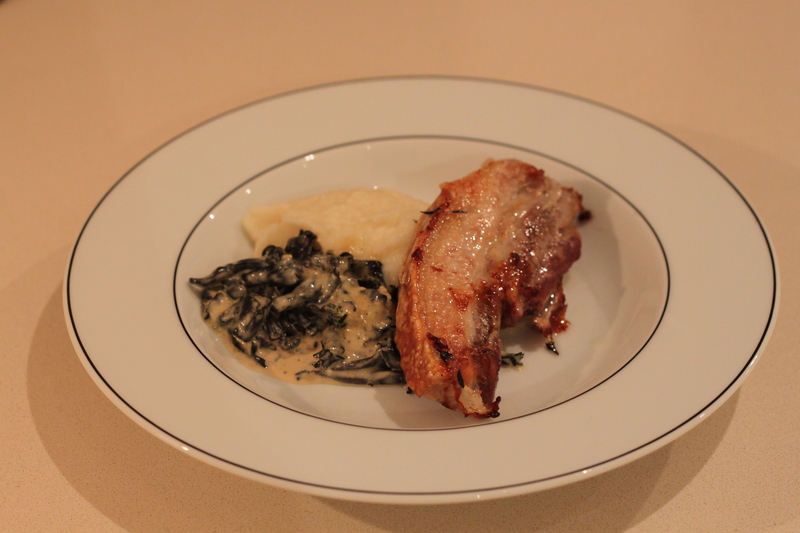 This dish has almost the same components as last time I made pork belly, and I wouldn’t say that this is an improvement – just a variation – and just as good as the last recipe. 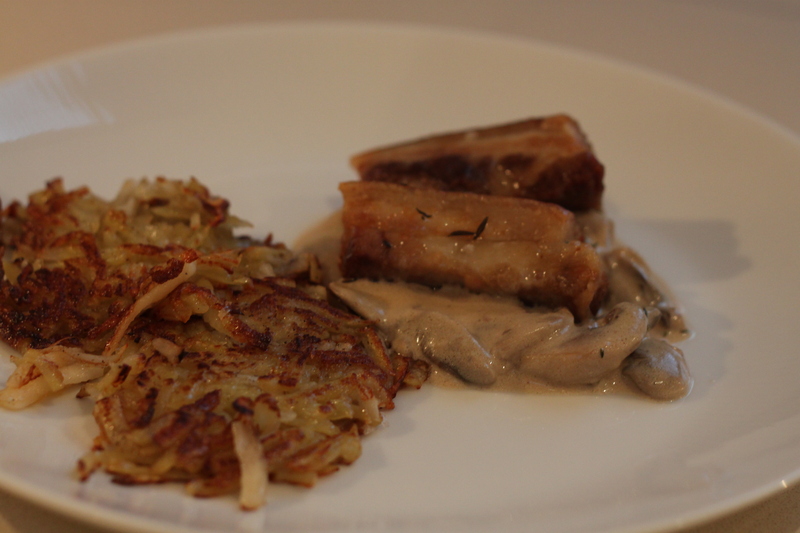 The crispy rosti (with both potatoes and Jerusalem artichoke) is crunchy and goes well with the tender meat underneath the crackling, and the creamy mushrooms certainly add nice flavours and brings the dish together. 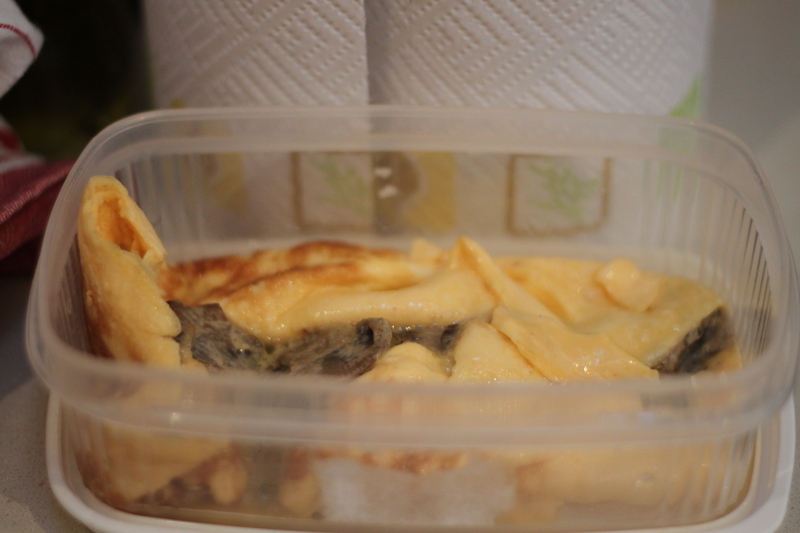 I ended up with some left over creamy ‘shrooms and they came to use for lunch next day as a filling in an omelette. Yummy that too! Preheat the oven to 125C. Place the pork in a buttered dish. Massage the salt into the rind and season the meat all over. Place the thyme on top. Leave in the oven for two hours or until the meat is tender. 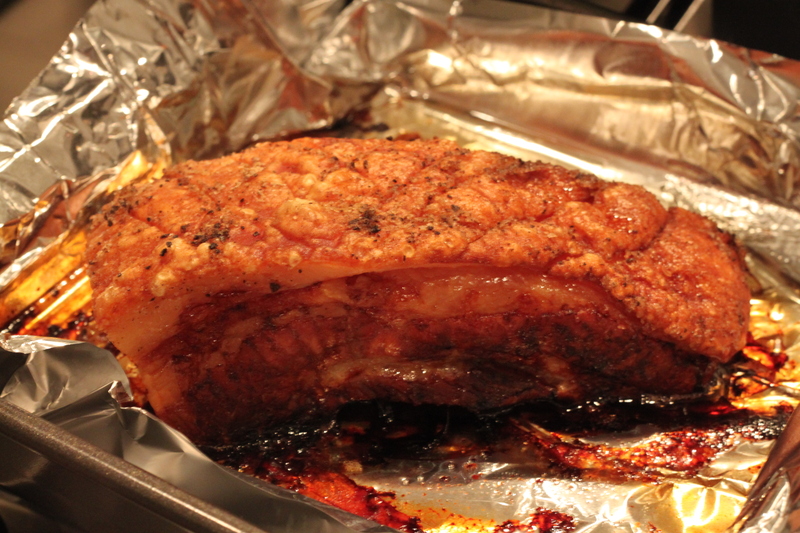 Turn the heat up to 250C and fry the meat for another 10 minutes until the crackling is crisp. Wash the potatoes and peel the artichokes. Melt the butter in a frying pan on medium-high temperature. Grate the root veg and place in four heaps in the pan. Flatten with a spatula and fry for 3-4 minutes on each side, until crspy on the outside and cooked through. Season. Brown the mushrooms and garlic in butter, but make sure not to burn the garlic. Add the wine and lower the heat. When the wine has reduced to half, then add the creme fraiche and cream. Let it thicken while stirring. Add dijon, thyme, vinegar and suger. Season. In a way it has been liberating food wise to move to the UK. It might sound silly, but in the UK everyone eats. In Sweden not so much. Maybe it is because the world’s perception of Swedish people as blond, slim and beautiful that Swedish girls in general don’t eat much. They are all very conscious about what they eat and unless it is low-carb, low-fat the food is merely pushed around the plate instead of put in the mouth. This is a generalisation of course, but for a foodie, this environment felt rather hostile. Moving to the UK almost four years ago, I could not believe it when the really slim women in my office had a sandwich and a packet of crisps for lunch. I mean bread? Crisps? And they still stayed slim. Was that even possible? Of course it was. In the UK people ate the way we did when I was young; everything in moderation. And it works. But you can imagine that if people don’t want bread for lunch they certainly wouldn’t eat crackling. In Sweden a few years ago it seemed that it was only chicken breasts and salmon fillets that people ate. Some still do, and I am sick and tired of both. But foodies eat differently, thank God, and restaurants with the same philosophy as St John are opening up everywhere in Sweden and it seems more OK to actually eat there now. Or maybe I just don’t care anymore. Preheat the oven to 125C. Place the pork belly slices in a buttered dish. Rub salt into the crackling and add some salt all over. Place the thyme on the meat. Let it cook for at least two hours or until tender. Cut the artichokes in equal pieces, cover with water in a saucepan and bring to the boil. Cook until soft. Turn the oven up to 250C and cook the meat for another 10 minutes until the crackling crisps up. Squeeze the water from the mushrooms and chop roughly. Fry in the butter on high heat for about 5 minutes. Add the wine and let some evaporate. Add the cream and stock and let it thicken. Purée the artichokes with the butter, season ieth salt and pepper. Crackling. One of my favourite English words actually. I just think it describes exactly what a crackling is. You totally get that it is something crispy that cracks, but it still sounds appealing. And crackling certainly is appealing. I LOVE that British people in general fight over the crakling when they eat pork belly for Sunday lunch. In Sweden animal fat has been taboo for a while, but it is coming back now. And in Denmark you can buy cracklings in bags, just like crisps, with different seasonings. Love it! I have cooked pork belly a few times now, as it was totally new to me when I moved here, it has been a bit trial an error. I have learnt though, that the key is to cook the meat slowly on low heat for a few hours, then turn the heat up to crisp up the crackling even further. Then it helps to let the meat rest for a while before serving and fighting over the crackling. Porkbelly with roasted root vegetables, broccoli and a creamy sauce. Heat up the oven to 125C. Cut lines in the fat in a check pattern if this is not done already. Rub with plenty of salt and the herbs. Make sure it goes down in the cracks. Season the meat all around. Cover a roasting tin with tin foil and place the meat, fat up in it. Place in oven and cook for 2-3 hours. When the meat is really tender, turn the heat up to 180C for 10 minutes to crisp up the crackling even more. Let the meat rest, covered in tin foil, for a few minutes before serving.